When listing the main staples of my diet, burgers definitely crack the top five of items. It’s really a perfect food for so many situations. Having a cookout? Make burgers. Road trip? Buy burgers. Easiest menu choice? Burgers. Best burger related cartoon? Bob’s Burgers. So many West Coast people and this who have visited the West Coast have told me I needed to try In-N-Out Burger on a West Coast trip. 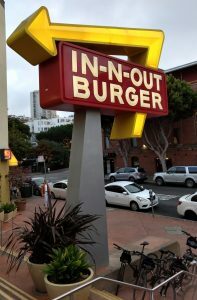 Finally having an opportunity, I made my way out to In-N-Out Burger in Fisherman’s Wharf in San Francisco to see what all the hype is about. Arriving at the restaurant, there is a line out the door, lots of people waiting for their orders and every table is full. Before even getting my food, one of the coolest things about the restaurant is the décor and setup. In-N-Out still keeps it very classic and simple. It feels like something out of the past. The kitchen is completely open so you can see how the food is being made the whole time. After about 10 minutes waiting, I got to order. The menu is so basic too with only 3 types of burger to order unless you have heard of the no-so secret menu for some slightly different combinations. The great thing about this basic menu is it allows them to really make those few items well. To maximize this visit, I ordered 2 people’s worth of food. If I didn’t do this, how could I really get a feel for the food? I order 2 Double-Doubles (one Animal Style), fries, a drink and a chocolate shake. Right there is $17 of fast food all for me. Then the waiting started. 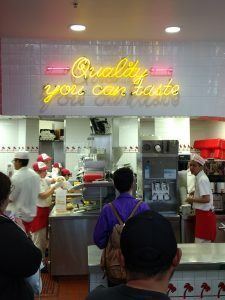 With so many people seeing In-N-Out as a tourist attraction, as I did, you will wait 15-20 minutes for food after ordering unless you get something simple like a plain burger. By the time my meal was ready, I had to bump and push my way to the counter. There were still no seats so I had to eat outside. I put the overflowing tray down and pulled out a camera to snap a bunch of pics. Right away the guys at the table next to me outside knew I was a tourist. I started eating with the regular Double-double. This was pretty good. Meat is cooked well. No overpowering flavors. It was a very basic double cheeseburger. I would have sips of my chocolate shake and eat some fries I between burger bites. It was a respectable shake. The malt flavor was still noticeable mixed with the chocolate. The fries were fresh, crispy on the outside and soft on the inside. Those were definitely the best fast food fries I’ve eaten. 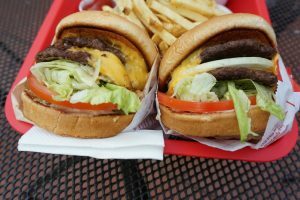 I took my first bite of the Animal Style Double-double and I get why everyone raves about these. It is part of their not-so-secret menu. The addition of grilled onions, pickles and extra sauce made it one of the best tasting fast food burgers I’ve eaten. The In-N-Out sauce is the best part of that burger. I would love to have that on burgers more often. 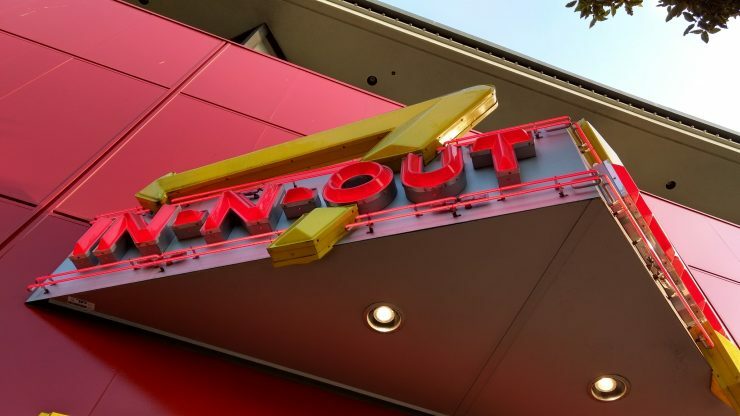 I think what I loved most about this is while all other fast food burger places are adding so much to their menu, In-N-Out adds nothing focusing on quality of the food. An aside, this gets back a little to keeping the menu basic. On this trip I watched the movie The Founder about the rise of McDonald’s. It’s interesting how McDonald’s started with a menu similar to In-N-Out has today. The difference would be that Ray Kroc got caught up with success and expansion and then the company got caught up completely with adding menu items and regional dishes. In-N-Out in that same time, didn’t change much, didn’t over expand, and lines are still crazy. 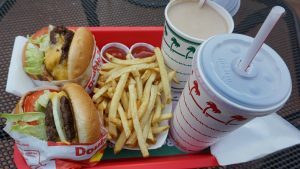 Most people want a simple and tasty burger or cheeseburger and In-N-Out does that well. During my meal, I got to talking with the guy at the table next to me about how this was my first time trying In-N-Out Burger. He spent some time on the East Coast and was familiar with Five Guys Burgers, which is definitely a favorite of mine too. He wanted to know which one I thought was better. Both are similar burger styles with a pressed flat patty and made to order. I wouldn’t say there is one burger that is a clear winner. I think anyone who lives near an In-N-Out will easily say it’s the best fast food burger. This guy next to me firmly believed In-N-Out was best. In-N-Out was by far a delicious burger that was relatively healthy. Five Guys is different because there are more topping options, more flavor combinations, more grease and most importantly the ability to add bacon. All those additions make for a messy burger and sometimes that’s something I want. I would certainly have an In-N-Out burger again, but I don’t know if I’d wait 30 minutes for one again. If it was a short wait, damn right I’d get another Double-double, fries and a shake.